Quora answer: Are there any symbols or icons representing the concept of reality? To answer this question we have to lay some groundwork because this is actually a very deep question, something unusual here on Quora. But let us start from the question asked and try to explain the components of it. As has been said many times by me in various answers there are four aspects of Being which are Truth, Reality, Presence, and Identity and their opposites (anti-Aspects) and so all of these need to be considered together. Being of course appears in this statement as the first word “Are there . . .” Being has many roots and the “er” is one of them. When we refer to the “concept” of Reality we are talking about intelligibility, and intelligibility is the main manifestation of Being. Since Reality is an aspect of Being we are asking about intelligibility of Being itself which is Heideggers question of the Meaning of Being. So the question is under this interpretation are there any symbols or icons that express the meaning of Being with respect to its aspects? Now Being is an artifact of language unique to the Indo-Europeans, it is in fact the central or highest concept of Indo-European language which is the basis for relating everything to everything else as we use language. It has several meanings which are conveyed by the aspects, and several roots because it is a idea that is fragmented. Ideas refer to illusory continuities and concepts refer to non-representable “meanings” beyond all representation. The illusory continuity of the Idea of Being papers over its fragmentation. The concept of Being is the essence of its intelligibility beyond all the beings that are its representations, say in language but also elsewhere in culture. Among these are various symbols and Icons. Now when we talk about symbols verses Icons we are really talking about the difference between symbolism and semiotics. An Icon is one of Peirce’s types of sign. Saussure’s semiotics is relational (deals with signs as only Seconds), and Peirce’s takes into account mediations (what he calls thirds). Peirce developed semiotics in order to understand Logic better in its practical context of everyday use. And generally signs are the structural components of symbols. Signs are like patterns while symbols are like forms, in as much as symbols are the next higher synthesis beyond the sign. It should be noted that a “Idea” as ‘illusory continuity’ is equal to a Symbol (Pure; determinate; form, arrow or mapping; Third, continua; two dimensional) + Sign (Process; indeterminate, probability; pattern; functor; Second, relata; one dimensional) + Trace (Hyper; fuzzy, possibility; monad; modulation; First, isolata; zero dimensional) + Nuance (Wild; propensity; facet; fluctuation; Zeroth; negative one dimensional). We are noting here the meta-levels of Being, Schema, Math category level, Peircian Principle, and the dimensionality that seems to be related to each level of the Idea as illusory continuity. We are not saying that this set of relations can be completely defended under close analysis but giving this a a first level approximation just to demonstrate how complex the structure of the idea might be. But actually when you look into the relations between these various series the whole situation becomes even more complex than this. See my recent dissertation for more information and a closer scrutiny of the relations between these various series. Anyway, with this background we may perhaps be prepared to attempt to deal with the question at hand. Of course, the question is actually asking for symbols or Icons of ultimate reality. But we are going to have to deal with the mundane case first because that is so complex that unless we try to come to terms with it first we may become hopelessly lost as most people do in this maze. But on the other hand if we understand the mundane case then perhaps we will be amazed at the outcome when we consider ultimates. So our first question is whether there are any symbols, or icons of reality at the mundane level. And this is where the Craytlus comes in because it considers the question as to whether there are true names or not and it is posed as a comedy of naming. Basically there are two interlocutors one representing the position of conventional names and the other representing the position of true names. But when Socrates begins giving his etymologies for terms to get at their true names then he completely mangles the language as Heidegger is known to do on a regular basis, trying to force roots of words to say something about their real, true, identical, present, i.e. aspectival meaning. It is fascinating that what we want to know is whether words have an aspectival dimension or not. Now we can understand that Being has meta-levels and each meta-level has its different version of the aspects, and thus the apsects become essentially different at each meta-level. So for instance Heidegger talks of Truth as verification, while at the deeper process level it becomes Alethia which is uncovering, a process by which we know a deeper truth as seen in the Oedipus saga. Now this has a deeper connotation when we realize that a formal system is made up of Truth, Presence, and Identity aspects with its properties being the relations between the aspects being consistency, completeness and clarity (wellformedness). Now when you add the aspect of Reality you get three more properties in addition to those of the formal system which are validity, verifiability, and coherence. So what Heidegger says about verification, can be extended to all of these properties. At the next level up, i.e. at the Process Being level all of these properties would be transformed essentially. How that would look I have not worked out because I just thought of it. But the key point is that this aspectival nature of words strikes to the heart of our worldview because it relates to science which compares theoretical models (formal systems) to the empirical world (reality). But what is not recognized widely, what is reality changes at each meta-level of Being, so there is no unified answer to this question because Being is fragmented among its roots and among its aspects. So we can reinterpret the question to ask if any of our words represent the noumena as they are in themselves, or not. And then the more esoteric question merely asks whether in terms of the ultimates whether this problematic holds as well. Now I could punt the answer to say all my works are attempting to get at this question within its proper problematic, seeking deeper and deeper solutions. But that would be merely saying that this question is one way to strike to the core of our worldview that posits meta-levels of the Indo-european centric concept of Being, and its aspects, and roots which are the sources of words which either do or do not indicate something about the noumena. To me the structure that is specific to our worldview is more significant than any answer, per se. In effect only Indo-Europeans can actually ask this question. Other traditions without Being as a fundamental assumption and tool for thought cannot ask it because they either have existence or only the copula to work with and not the artificial fabricated concept of Being which is itself an illusory continuity as a basis for answering it. However, other non-indo-european cultures have their own version of this question. Now Hinduism in which Ohm is such a symbol or icon is Indo-European and it spawned Buddhism as a heresy that attempted to say there was no Being (SAT) with regard to the Self, at least, and rebelled against the tyranny of Being as perduring illusory continuity beneath everything. Buddhists denied as radically as they could this continuity, and chose aggregates (tattvas, dharmas) as the heterogeneous basis of all phenomena. We get a picture of the full scope of the question when we put it in terms of the relation between Hinduism and its nondual heresy of Buddhism and their historical interaction. The Hindu and Buddhist views of ultimates are very different due to the duality embraced by the former and the nonduality approximated by the later. This might constitute a mere prolegomena for an appropriate answer to this question. It is not something that can be definitively answered in a short space of text but something that can take a lifetime of exploration. One of my favorite examples of someone who struggled with this question in a completely different context is in Knowledge Painfully Acquired by Lo Ch’in-shun. 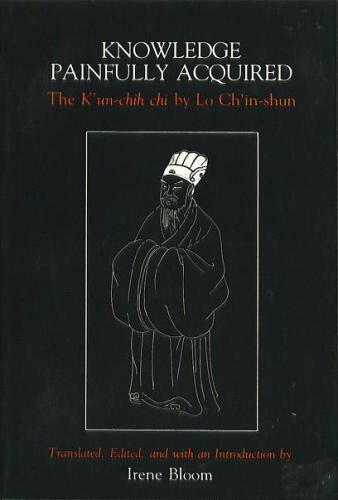 He spent a lifetime trying to understand what the original Chinese tradition had to offer that Buddhism did not offer and he presents a final answer. I like his answer because it comes from an obvious rumination on the problem for years. Since my own studies of this question are not as mature as his I will defer to him in this case. Quora answer: What are the best existentialist films? Why do I like Andre Rublev better than all other films? I like it best because it comes closest to portraying a whole world. Most films are slices of the world which they portray. Few films strive to portray the whole world not just a slice, or several slices of it. Existentialism is a movement in Western Philosophy with Dostoevsky, Kierkegaard, Sartre, Heidegger and others. It is really a rebellion against the normal view that the Being of Essences is primary, and it instead says that the existence of the individual is primary, and normally concentrates on the absurdity, or paradoxicality of individual existence. Hubert Dreyfus has a great course on Existentialism that has been recorded as an audio and has been released previously. Not sure if it is still available. In it he discusses Hiroshima Mon Amor and how it exemplifies Kierkegaard’s philosophy and then he talks about Brothers Karamazov and how Dostoevsky has similar distinctions as those made by Kierkegaard but predating him, and with no known influence between the two thinkers: one a philosopher who wrote works like a novelist, and the other a novelist who wrote philosophically. Heidegger took up the Existentialist banner but what he meant by it was the ecstasy by which dasein as being-in-the-world projects the world from groundlessness which envelops dasein. For him it was a way to talk about something prior to the separation of the dual of subject and object. Heidegger developed the theme of authenticity when dasein frees itself from the Group (They, mitsein). Sartre on the other hand concentrated on the theme of human freedom and we have radical choice to make our world as we see fit at every moment instead of falling into bad faith. However, all of these philosophers never really free themselves from the pale of Being, from the shadow of Being, and thus their views of existence are still entangled in Being. Thus being embedded in the Western Philosophical Tradition they never manage to take a stand outside Being, as Exi-stance suggests. So Existentialist themes tend to be about contradiction, paradox and absurdity, one of the limits of the worldview as seen in Plato’s divided line, i.e. the limit of Doxa (opinion, appearance). For Kiekegaard our religious views are absurd not rational as Hegel taught. For Heidegger it is the paradox of avatarism, where something projects the world in which it finds itself, i.e. dasein is like Christ, god and mortal at the same time. For Sartre it is the fact that being-in-itself and being-for-itself and being-for-others are in radical conflict and that the synthesis of being-in-and-for-itself and being-in-and-for-others cannot be reconciled. The only choice is radical freedom of choice where the individual chooses the life that is meaningful to themselves without their life being stolen by others or by becoming reified into a thing. Consciousness appears as groundless, i.e. out of Nothingness but that in fact is what gives us our radical freedom. The key scene for me in Andre Rublev is when the boy whose father was the bell maker but died, and he claimed to know the secret of bell making, but in the end after he successfully makes the bell he admits that his father died without telling him the secret. This is the existentialist scene par excellence. The boy was self made by his radical choice to pretend he knew the secret, and by pretending he actually did know the secret and was successful against the odds of making a bell that rang and was not cracked. The boy took his chance by a choice of radical freedom to remake his life by pretending to have a secret he did not have. The paradox is that knowing the secret is pretending to know the secret and that changes the world for the boy who becomes what his father was the Bell Maker. Of all these theories of what existentialism is probably Sartre’s is the best. Now Sartre’s work Being and Nothingness is considered Passe, and it is generally accepted that he just did not understand Heidegger. Heidegger wrote his Letter on Humanism to draw a distinction between himself and Sartre, between the NAZI and the COMMUNIST. Heidegger was anti-humanist and accused Sartre of implicit humanism. But we now know that Heidegger’s Being and Time was based on the unpublished works of Husserl which are very similar in theme and tone to Heideggers (so called genetic phenomenology in Husserl). Also we know that Heideggers lectures on Aristotle were key to the development of his phenomenology in an effort to distinguish his phenomenology from his teachers. And also he returned to the Phenomenology of Hegel for inspiration taking the term Dasein from Hegel’s logic. At one place Heidegger says dasein is Geist (spirit/ghost/mind). So Sartre’s interpretation of Heidegger in light of Hegel so that he could fit phenomenology and existentialism into a Marxist context may not have been too far from the truth. Sartre redeemed himself by writing Critique of Dialectical Reason, his most brilliant work, which of course no one studies. This work is very close to what Cannetti talks about in Crowds and Power where the pack is like the fused group of Sartre. Dostoevsky is trying to show that his version of Russian Orthodox Christianity, is the solution to the dualism of Protestantism (the inquisitor) and Catholicism (the returned Jesus). Each major point in the novel according to Dreyfus tries to posit that solution to the points made in the inquisition that merely remain paradoxes. In effect the story revolves around the choice of one of the brothers to take responsibility for the murder of the father who deserved death even though he was not guilty an existential choice. Kierkegaard raises the ante by saying that all religion is absurd, and cannot be understood by reason at all, case in point Abraham’s decision to kill his son when the law is thou shall not kill. The miracle that saves the son cannot be understood by reason, and thus actually all human existence is really absurd due to its religious dimension. 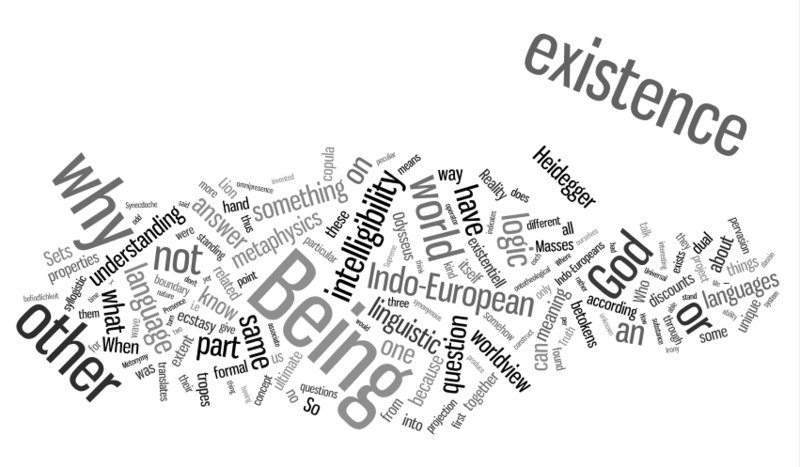 Heidegger is really using Existence as a technical term to get beyond dualisms set up in Humanism i.e. subject/object dichotomies. It is really a way of talking about how Being gives rise to itself from itself in human beings, beyond what we can will, i.e. as an ecstasy we cannot control and which we find ourselves engulfed by. It is Sartre that focuses on the problem of human freedom, and how we have the freedom to break from the past, and the expectations of others, and he used that philosophy to underwrite revolutionary movements around the world. Sartre went back to Hegel as the source of all these existentialisms. And he was probably right about that because Hegel in his logic specifically identifies nothing which is the opposite of Being as Buddhist Emptiness, so in fact of all these philosophers Hegel has the true nature of Existence in mind as the distinction from which to build his philosophy of the Logic of Being. In the movie Andre Rublev the whole movie is in black and white when it is talking about his art, but in the end we see his art in color. What is being said by this is perhaps that in spite of the harshness of the world within which Andre Rublev existed he had visions of what lay beyond that world, but which grew out of the world that encompassed him. In effect his art was a way of embodying the spirit of Orthodox Christianity that rose above that world to make it something different when one considered Gods relation to that world. To me Andre Rublev is the ultimate movie because it draws a picture of a whole world in which Andre Rublev lived and then his radical freedom to imagine what was beyond that world and give that vision to others through his art. http://bitly.com/ieG1Vs Revolution in Photography: so much more information in a picture . 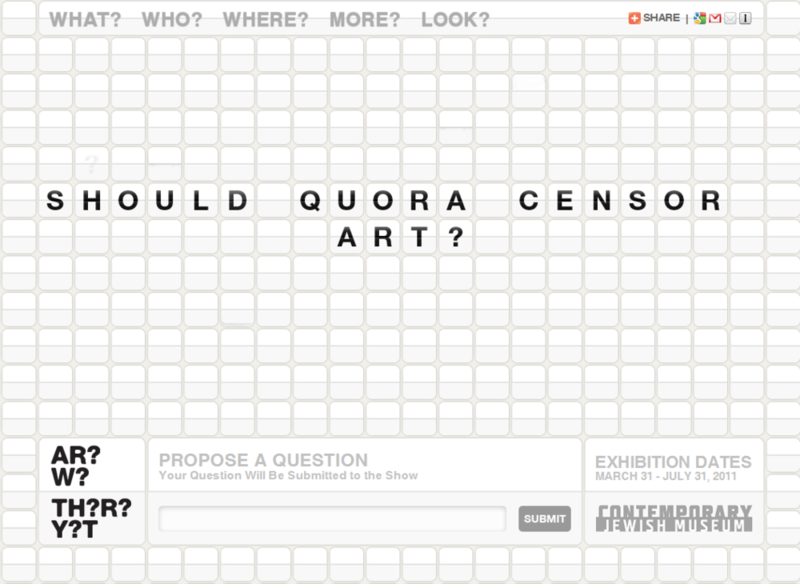 . .
Quora censors the art of the question: Should Quora censor Art?